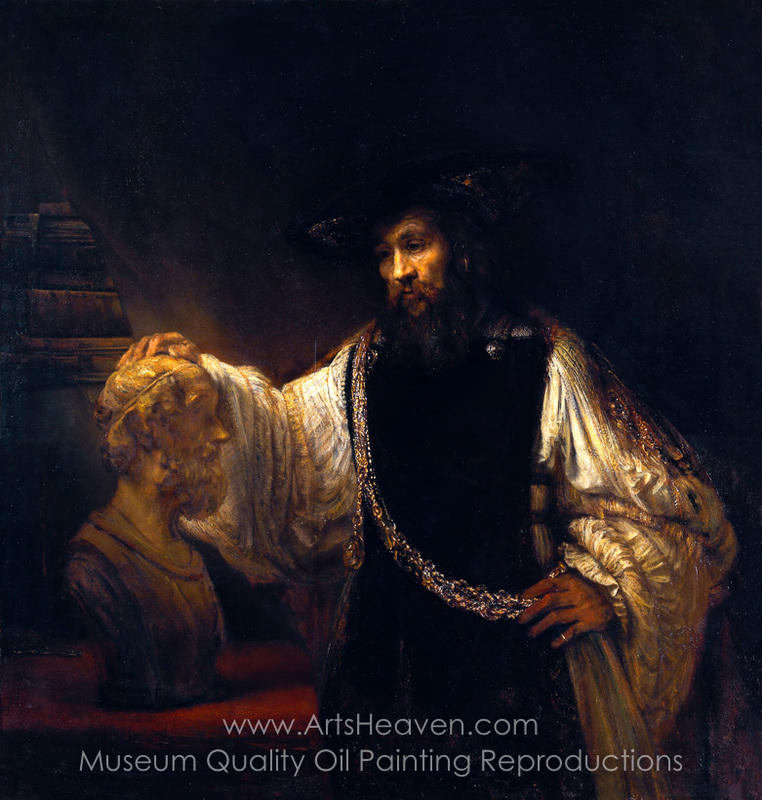 Painted in 1653, Rembrandt�s Aristotle with a Bust of Homer, encapsulates the philosophical enterprise in action. Aristotle, known in Rembrandt's day as a philosopher on a par with that of Socrates, contemplates a bust of the great poet Homer. In this stunning allegorical work, often used as an avatar for any topic with a philosophical edge, the painter becomes an early advocate for interdisciplinary practice, showing the interrelationship between art forms and their subsequent reinterpretation. Commissioned by an early collector of fine art, Don Antonio Ruffo, Rembrandt was given free reign to his creative prowess. Clearly pleasing his patron, the artist chose a subject close to the hearts of high-minded aficionados of seventeenth century Sicily, settling on an imagined encounter between the writer of the seminal classical work The Poetics and the legendary poet of the oral tradition, Homer, whose Odyssey is still the cornerstone of classical studies. Encapsulated in the bust in the same way that his presence is felt through his works, the poet Homer is an impossible figure to historicize. Aristotle, a traceable individual, is given the iconography of a human form. Yet rather than gazing towards his muse Aristotle looks beyond the sculpture. Adorned in contemporary clothing, the philosopher stares eruditely at the world beyond representation, the debris of life that it is the thinker's job to assemble. However, there is a third character in this canvas in the form of a medallion that Aristotle wears. At first glance, one might think that this medal is merely part of the decorative ambience. But the costume the philosopher wears carries a great deal of meaning. First and foremost, his clothes are modern, perhaps those of the painter, while the bust remains in its archaic configuration. On the medallion can be found the head of Alexander the Great, who Aristotle tutored. From poetry to philosophy, Rembrandt relates the artistic sphere to politics by tracing the lineage of the ideas that, through education, shaped the policies and adventures of Alexander. Aesthetically, Aristotle with a Bust of Homer is a stunning visual treat, the light dancing across the dim intimacy of the canvas. Like the illuminating ideas that both punctuated and immortalized their likenesses, so too are Rembrandt's subjects cast in an ethereal shaft of light. Bought for the then-staggering sum of $2.3 million dollars in 1961 by the Metropolitan Museum of Art, Rembrandt's moving rumination on politics, ethics, and art, was briefly the most expensive painting ever sold. 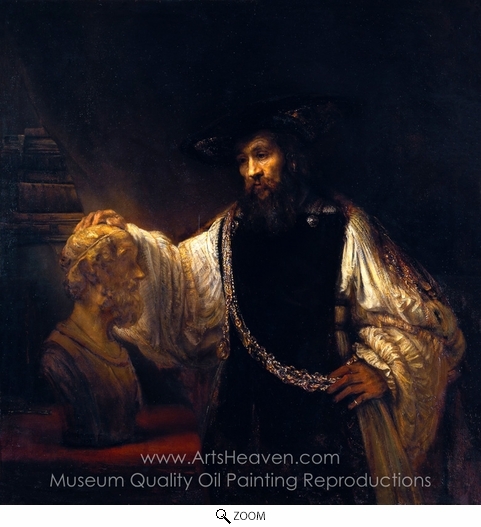 Decorate your home or office with our beautiful museum quality art reproduction of Rembrandt Van Rijn Aristotle with a Bust of Homer painting. Why settle for a print, poster, giclee or canvas transfer when you can grace your walls with a genuine oil on canvas painting reproductions for sale at up to 75% below gallery prices. You are commissioning an authentic hand-painted oil painting on quality artists canvas. Painted by professional artists brushstroke-by-brushstroke with attention to all details. Order your Masterpiece today and get Free Shipping to your door direct from our studio.